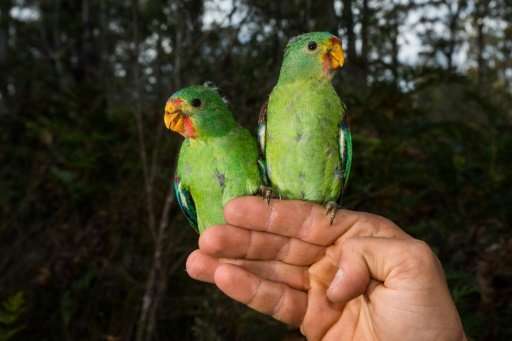 Critically endangered Swift Parrots are under threat from squirrel-like "sugar gliders" in a battle for space in Australia's ancient forests, scientists say as they race to save the rare birds. Critically endangered Swift Parrots are under threat from squirrel-like sugar gliders in a battle for space in Australia's ancient forests, scientists said Wednesday as they race to save the rare birds. Swift Parrots are migratory and only breed in the southern island state of Tasmania. But the nomadic nectar-eating birds' nesting grounds—gum trees—are also popular with sugar gliders, small possums believed to have been introduced to Tasmania in the early 19th century. The marsupials, which launch themselves from tree to tree and rarely descend to the ground, eat the nesting birds as well as their eggs and chicks, the Australian National University scientists said. This year, both species are battling for real estate on Tasmania's east coast due to abundant eucalypt flowering in the region, which contains some of the world's oldest trees. "In some of these places, we've never had a chick survive," ANU conservation scientist Dejan Stojanovic said in a statement. "If we don't intervene immediately, this year could be a huge blow to the conservation of this species." Stojanovic and his team have designed nesting boxes with light-sensitive doors that open at sunrise and close at sunset, protecting the parrots from the sugar gliders in the night when the creatures are active. Conservationists have designed nesting boxes with light-sensitive doors that open at sunrise and close at sunset, protecting the parrots from the sugar gliders in the night when the creatures are active. The doors are powered by solar panels and have back-up batteries, with the team setting up a crowd-funding campaign to pay for them to be fitted onto 100 nest boxes already in the area. Early tests worked well and the birds "didn't mind the machinery", Stojanovic added. Swift Parrots usually arrive from the Australian mainland in August before flying back north in February and March after the breeding season, according to the Tasmania's Parks and Wildlife Service. There are no recent estimates of their population, but a 2011 assessment cited by the Australian government estimated there were only about 2,000 mature birds, with the population declining.